Get ready for next year's Tour de France! Home > Blog > Get ready for next year’s Tour de France! 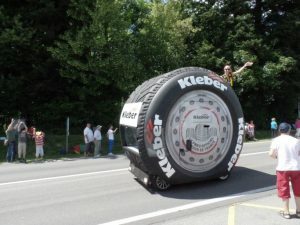 There have been surprises galore so far in this year’s Tour de France with “Froomey” cycling very fast downhill as well as uphill in his newly discovered “ET go home” position; emerging star Adam Yates being shockingly ambushed and sent flying by the inflatable “1 km” banner (if you have not seen the footage of this unbelievable stroke of bad luck and rotten timing, watch Orica BikeExchange’s YouTube footage); and yesterday’s exciting stage win by stellar young Australian sprinter Michael Matthews, who out-sprinted the world champion, Peter Sagan – sweet revenge for the last World Championships! Exciting young riders showing their potential and old hands demonstrating surprising new tricks, what an exciting Tour. Knowledgeable fans watching it all unfold on the TV will have been leaping off their sofas, and we are getting breathless reports from clients following it at the roadside in our motorhomes. 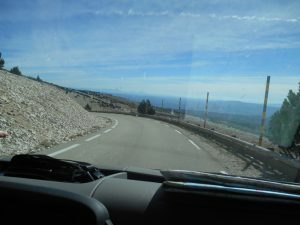 Every year during the Tour de France we see a massive spike in demand for campervan hire in France as the images of Le Tour (and the tens of thousands of motorhomes following it!) are shown all over the world. As usual during the Tour, pretty much our entire fleet is following it with American, Australian and British clients filling most vehicles this year. 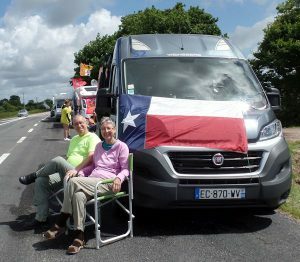 Serial Tour followers and clients Frank and April Rippel from Texas, USA (above: featuring one of our gorgeous new Euro-Traveller Prestige campervans in action!) are back again this year and are publishing some great photos of their adventure as it unfolds on their blog RippleTours. 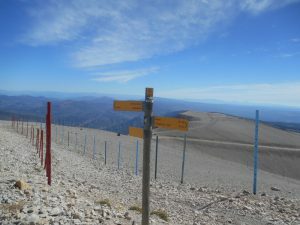 View from the top of Mount Ventoux, it is very high up! 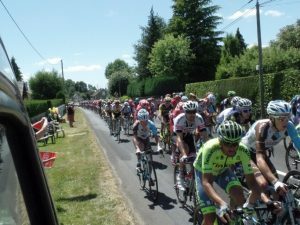 By the time this year’s Tour finishes, we expect to have campervan availability issues for the 2017 Tour de France (starting in Dusseldorf, Germany on 1st July). So if you’d like to follow it next year, take a look at our 2017 Tour de France Special Packages and get in touch to book your van before it’s too late! 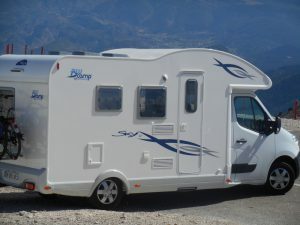 ← Can I cross from France to the UK in a motorhome?